How to measure quality and anticipate product defects? In this guide, we will discuss specific quality metrics and show how they contribute to the overall strategy. Who are the stakeholders of quality? Quality is not an absolute value. When talking about quality, we always talk about the perception of quality. Who perceives the quality of the product or service? Prospective clients might be fascinated by your marketing and buy on a very basic perception of quality (quality of package and marketing materials). Customers who used your product for a longer time will have a much better idea about its quality (as applied to their needs of course); those who will find the match will become returning customers; those who won´t – will switch to the competitors. High-end customers will most likely have different needs and different ideas about the product’s quality. Your team will deal with the internal mechanics of your business, and their perception of quality will be more related to the product architecture and complexity. We also know that the idea of quality is domain-specific. Still, we can observe that the approach to maintaining high quality is very similar across different industries. For example, the idea behind quality metrics for the pharmaceutical industry looks similar to the approach used in the steel industry, software engineering or aviation. Below, we will discuss some popular KPIs for quality. For the best implementation results, make sure that these metrics fit your business context perfectly. We discuss how to achieve this in the second part of the article. In its classical form (a question “Would you recommend us?”), this metric indicates a general perception of the product or service. Any customer feedback is important. In some cases, we only know about the problem after getting an email from an angry client. Your customers still care (otherwise, they wouldn’t spend their time giving you feedback). There is some problem that needs to be fixed. There is something that you didn’t know about your product before, and you need to improve your quality control system. A general approach to complaint solving is to understand and fix problems in the business systems rather than blame specific people. In many cases, prospective clients cannot really evaluate the product before buying. Still, they can make a good choice based on social proof metrics. Average rating score. The aggregated value of the clients’ rating of the product and their comments form social proof metrics. In this case, we look at the hotel rating or starts on Amazon and form our expectation of product quality accordingly. This quality metric is similar to NPS, but in this case, buyers are more likely to share more detailed unbiased options. The more effort your team invests in the quality control and assurance, the less problems you will see reported daily. Instead of fixing obvious the problem, now you need to read between the lines and understand what issues (less obvious ones) prevent users from unlocking the true potential of your product. Fighting complexity is tough, but it’s worth the time you spend on it. Here is an example of how eliminating unnecessary complexities can help organizations to improve. Sometimes, quality specialists have to justify their budgets and strategies in board meetings. Here are some finance-related quality metrics to use. In many cases, the goal is not to find the exact dollar value, but to understand how big the impact is on the stakeholders´ perception of quality. This indicator summarizes the values of the indicators inside, giving us the total cost of quality. In my example, the calculations are for the average cost per accident. Similar to the “Cost of Poor Quality,” but in this case, we are estimating the costs of trying to achieve excellence. Achieving high quality also has its cost. For example, decreasing the defects rate from 1% to 0.01% might be a cost-effective goal, but reducing the defects rate down to 0.001% might be too costly and won’t make sense for the quality stakeholders. Its formula depends on the specific situation. For this example, we can calculate the budget needed to decrease the defects rate from 0.01% to 0.001%. The resources of any organization are limited. We cannot treat all quality issues equally; some need to be solved immediately, and some will stay in your backlog for a longer time. 0% is something that potentially influences your customers, but you have no proof of it. 100% is for the critical factors that, for example, will prevent the customer from buying or will result in important costs. (A) was a critical issue for a big potential client, and three other clients had previously asked about this. (B) was a less critical issue for the existing client and only one more client had requested a similar feature. Our efforts to “fix the problem” (actually, develop new functions) were about the same. In this example, the value of the opportunity metric was higher for “A,” so we gave it a higher priority during the implementation. Instead of fixing quality issues, let’s be proactive. Let’s work to decrease the possibility of future quality problems. How can we predict something that has not happened yet? To predict some important quality problems, we need to look at the preceding, less important problems. That’s what broken windows theory teaches us about. That’s how aviation administration tries to prevent accidents in the air. That’s how Alcoa approached achieving their zero injuries goals (see “The Power of Habit: Why We Do What We Do in Life and Business” by Charles Duhigg). How to build a near miss metric? Implementing Near Miss metric is about changing the culture of the organization. You need to teach your team to report and discuss minor quality issues that might lead to more important problems. Similar to the Near miss metric, but in this case, we want to be proactive. Instead of waiting for some quality issues to appear, we ask our best experts to review the product/service requirement documentation and spot possible problematic points. In software development, the experts review the software requirements for ambiguity. The requirements, in this case, are the preceding documentation, so if we make the requirements better, we can prevent future quality problems proactively. Similar to the requirement ambiguity metric, but in this case, we can ask experts to review anything – our product, user manual, customer service. WTF/minute (What’s This For / Minute). The original metric was for software code quality reviews, but as you can imagine, it works in any domain. Another metric is useful to estimate the quality of large samples. This is applicable mostly to physical products. For example, in a supermarket, you don’t need to check out the expiration date on each pack of milk or cheese – just pick few at random, and if you found some of them have expired, then you can have a rough estimation of the problem. Obviously, this approach works on early product stages where there are often quality issues. With the development of quality control systems, the size of the aleatory sample should be increased. Sometimes, we have to check the “quality of quality,” e.g., how the quality control system works itself. Do quality reviews actually work? Do automated tests actually detect the problems? The idea of self-test is to introduce the input with known errors and see if those pre-engineered problems were detected. Medical analysis laboratories have this routine implemented. The laboratory equipment is a combination of complex optic devices and chemical reagents. The factors of quality are the way reagents are stored, the quality of distilled water, the stability of the electric current, human factors, and random errors off course. The easiest quality control, in this case, is to load a known set of samples and compare actual results with expected ones. Regulators use the same approach doing blind tests when the properties of the test samples are not known beforehand. This approach works as a starting point before doing more expensive and time-consuming tests. Similar to the self-test, but in this case, we are not looking at the system as a black box, we can do more specific automated tests. Still, we need to balance automated test coverage with the cost to develop and maintain such tests. The quality of the system can change when the environment changes significantly. The idea is to foresee the possible conditions and try to be prepared. Imagine a best- and worst-case scenario and try to come up with emergency plans. Have a smartphone? Try mountain hiking during the winter season and see how long your battery will last. Do you run a website? Will it survive a DDoS attack? Designing consumer products? Will it work properly if used in India? For example, to illustrate this article and create a scorecard for quality, I was using our BSC Designer software. This always helps in generating some improvement ideas. When the complexity of the product is high, changes in the product might produce many quality issues. The solution to this challenge lies in the level of product architecture. For example, software engineers build their solutions using microservices to avoid bad dependencies. If we change function “A” of the product, how likely is that something will be broken? As a leading factor for future quality issues. We tried to fix the problem on the design stage. We tried to fix the problem before the customer (or other stakeholders) saw it. But sometimes, a problem passes all these filters, and customers face a quality issue. We discuss below the metrics that we can track in this case. Yes, there was a problem, but it was fixed overnight. That’s a wow experience for any customer. 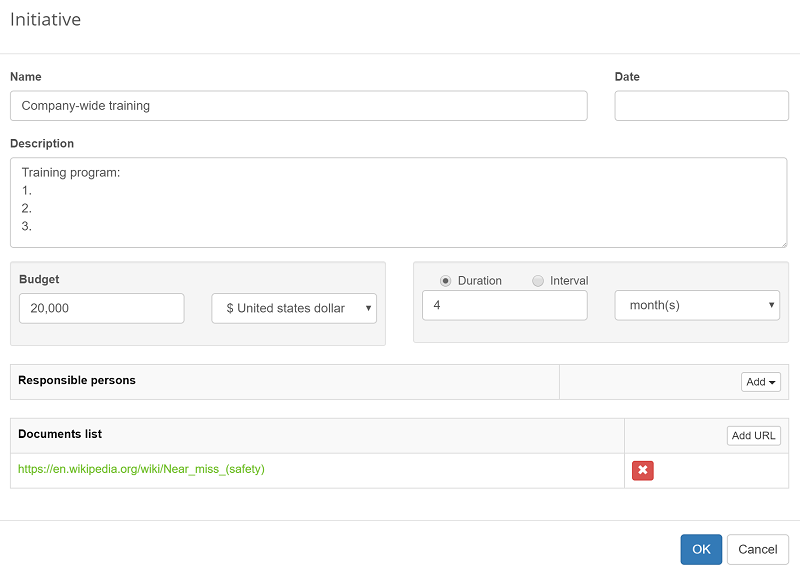 Track separately timing for different stakeholders. See the risk paragraph for the detail. In many cases, the problem is not that critical for the client, and what is more important is that your team care. A quick email, “Hey, thank you for reporting. We are on it, expect a fix in 2 days” will show a customer that you care. 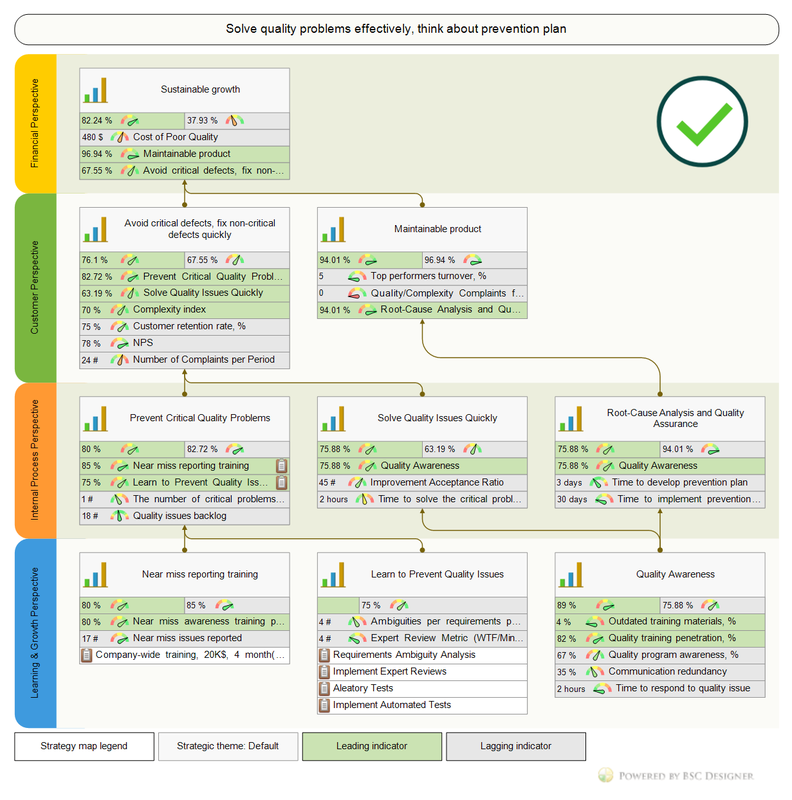 Similar to the sales backlog, a quality backlog is an indicator of how quality flows throughout your organization. Overloaded backlog shows that your response efforts are not sufficient, and something needs to be changed. If analyzed together with issue fix time and returning problems rate, % it might give some information about the team’s performance. Imagine that a company did a quality audit. For example, using the requirements ambiguity analysis described above. We need to make sure that those findings are analyzed and closed. We are not always talking about implementing the recommendations, but at least they need to be reworked into some tangible form (for example, updated requirements). The complexity is a known leading factor of quality. Communication redundancy, % = (Average message size – Shortest message size) / Average message size. Did the customer need to make just one call to fix the problem, or it was an exchange of five emails to solve a simple issue? Communication redundancy, % = (5 – 1) / 5 = 80% redundancy. We fixed the problem, and we communicated efficiently and effectively along the process, but was the problem actually solved? These metrics work best if bundled with the time to solve metric. The organization needs to find a balance between the speed of providing solutions and their effectiveness. Quality culture is about establishing new behaviour habits that will help to avoid critical problems and maximize the effectiveness of solving less critical issues. Does your team have a habit of tracking and improving quality? Imagine a scenario when a user reports a problem in your product, but it appears not to be a problem but normal behaviour. The developers “reject” this report as a defect. A similar situation is when a tester of the product reports a problem that is rejected by the engineers. Where is the problem in this case? I believe it is in the ambiguity of the initial requirements. What was the reason for the problem? Why didn’t we detect it before? What can we change in our quality control system to detect similar problems? What can we change in our systems to eliminate the possibility of such problems? Off course, the degree of root-cause analysis should correspond to the importance of the product. Part of the quality assurance challenge is to detect and find systematic errors. Let’s say your SaaS is hosted on a slow server, and it results in many other problems with system usability. It doesn’t make sense to review all those usability problems when they are caused by a bigger systematic error. How should people report a “near miss”? What is root-cause analysis and how to conduct it? What is a response plan to the critical issues? We discussed this approach in the training scorecard article. Your team and your customers might suggest a lot of improvement ideas. The question is, how many of them do your engineers actually analyze and implement? If ideas go directly to the rubbish bin, then we cannot expect high morale from the employees. A better approach would be to establish a procedure to deal with ideas, similar to what we have discussed for the innovations scorecard. The poor quality affects the stakeholders of quality. Instead of seeing how customers leave, we can look at what they share in social media. Talent managers can track early indicators of turnover using the HR scorecards. I believe most of the metrics discussed in this article can be applied to your domain. Still, there are always some unique metrics that need to be tailor-made for a specific business. How to find these metrics? I do recommend having a look at the KPI System that we have for you. Did my guess work for you? It’s easy to explain; if something happens to a process that limits the system, it will affect the rest of the system. Another topic that we discussed in the KPI System is measurement implemented “by design.” Instead of trying to measure something afterwards, we need to build a product with future measurement needs in mind. Applying this idea to quality, we need to find out where the quality measurements can be implemented by design. When our end customer reports some issue, how will we know what is causing the problem? What can we change in the product or service to make quality measurement easier? The answer can be a simple checklist or a kind of black box with operation log recording. If you find ways to better measure quality, it automatically results in quality improvement. For example, in the software development domain, adepts of DevOps practices first create tests for software functionality, then build the functionality itself. On the one hand, it allows measuring quality better; on the other hand, it improves the quality out of the box. We discussed some ideas related to the quality measurement culture. A more important topic is how to focus a company’s culture in general on quality. There are many books written on the topic, and in part 3 of this article, you will find my short list of top 10 tips. The Balanced Scorecard is a strategy execution framework. What are the goals of quality? How do those goals fit into the overall strategy of the organization? How to track the execution of those goals? Below, we’ll create an example of the Balanced Scorecard for quality. Let’s continue with the perspectives of the Balanced Scorecard. What is the financial impact of quality? In other words, what will happen if stakeholders of quality are not satisfied with the quality of the product? If clients are not satisfied – they won´t buy or won´t do repeat purchase. If your team is not happy about product quality – they may leave the company to find a better place to apply their talents. If you don’t comply with the standards set by the regulator – your organization might be fined or closed. To ensure the sustainable growth of the organization, we need to satisfy the needs of our clients (stakeholders of quality like end users, regulators and team). What about leading indicators? The leading performance will come from the goals in the internal perspective that we will discuss below. Goal: Maintainable product. A product that is relatively easy to maintain, change, test, etc. That’s what your team want. If a product gets too complex, the members of our team will complain about this, and if we do nothing – they will leave. What about leading metrics? What can we do to prevent such cases? It depends on the specific situation, but I would say that we need to understand the reasons for quality/complexity problems. For that purpose, we’ll have “Root-Cause Analysis and Quality Assurance” goal in the Internal perspective that drives leading performance to the “Maintainable product” goal. How are we going to “Avoid critical defects” and “fix non-critical defects quickly”? How can we ensure that we have a “Maintainable product”? Again, these goals are too vague for now. To make them more specific, we need to align some indicators with them. How can we ensure that our team mastered, for example, “Near miss reporting”? 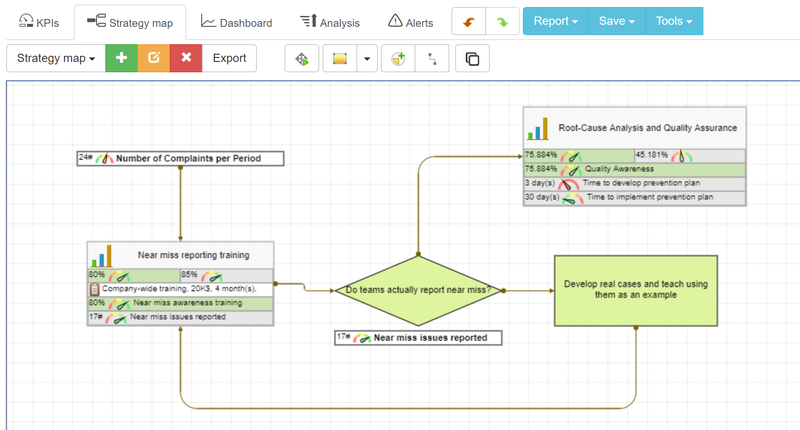 For this purpose, we’ll map the “Near miss reporting training” goal in the Learning and Growth perspective. What about the “Solve Quality Issues Quickly” goal? The basic measure will be Time to solve the critical problem. It is also important to train all members of the team to report quality issues properly. We can estimate the achievement of this goal by using the Improvement Acceptance Ratio metric. Finally, the “Root-Cause Analysis and Quality Assurance” goal contributes to the goal of having a “Maintainable product”. How can we make sure that our team is actually doing good root-cause analysis and quality assurance? How do we know that this time budget is spent effectively? 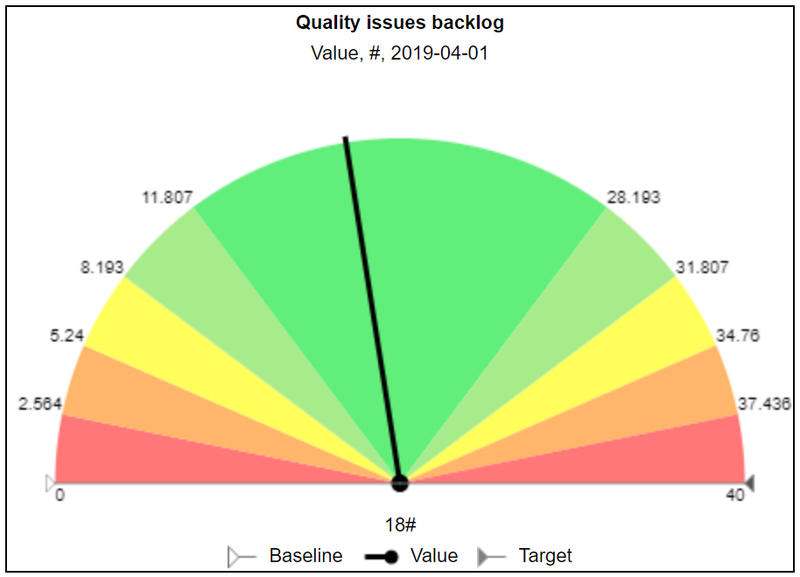 Internal stakeholders will start complaining about product quality/complexity (see the “Quality/Complexity Complaints from the Team” indicator). OK, we know how the quality team should behave. What should we do to equip them with the right skills and tools? The answer is explained below in the Learning and Growth perspective. I’ve separated them because I believe near miss reporting deserves special attention. 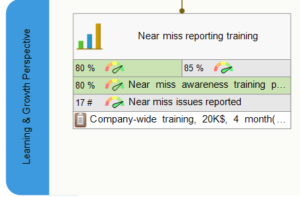 Let’s start with the Near miss reporting training goal. Obviously, we want all involved stakeholders to be properly trained. The results of the training is an exam score. Change in actions is what we measure with Near miss issues reported aligned with the Prevent Critical Quality Problems goal. How to measure the impact of “near miss” training on business? 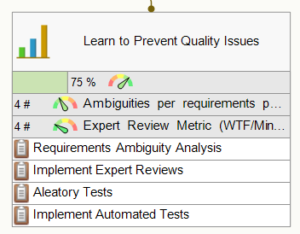 I’m looking at the Avoid critical defects, fix non-critical defects quickly goal, and I believe the Number of Complaints per Period is an excellent indicator for this purpose. Outdated training materials, % leading metric. 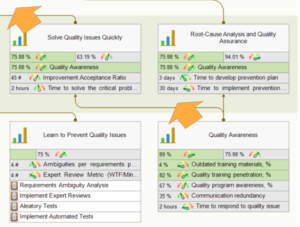 How can we quantify Quality program awareness, %? For example, by doing some simple surveys or tests. Let’s use this goal as an example and track how the logic of the strategy map works. 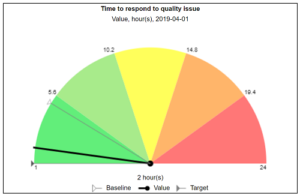 If our Quality Awareness program is a success, we can expect that, for example, customer support specialists will be responding quickly (Time to respond to quality issue metric metric) and efficiently (Communication redundancy, % metric).I’m moving to the “Internal” perspective. 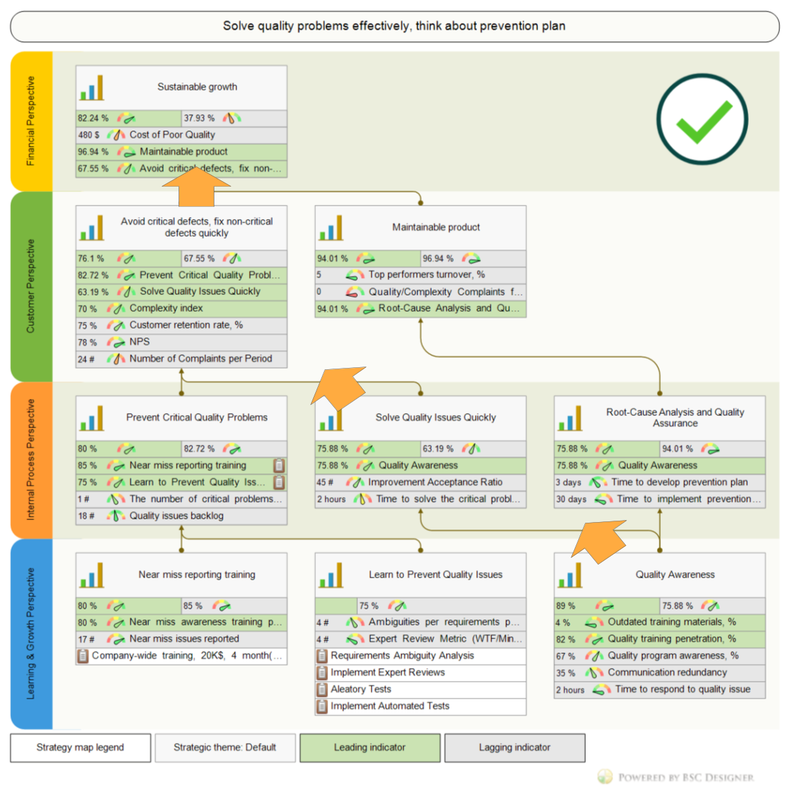 The Quality Awareness goal is a leading factor for the Solve Quality Issues Quickly goal. Basically, our hypothesis is that by improving quality awareness, we expect to solve quality issues better. And we will check this hypothesis by looking at the Improvement Acceptance Ratio, % and the Time to solve the critical problem indicators. We are now looking at the “Customer” perspective. Solve Quality Issues Quickly goal contributes to the Avoid critical defects, fix non-critical defects quickly, that finally contributes to the Sustainable growth goal in Finance perspective. Do these goals contribute to the Avoid critical defects, fix non-critical defects quickly goal with the same weight? Let’s suppose that preventing problems is more important than fixing them. BSC Designer software that I used to create a scorecard for this article will take these weights into account when calculating the leading performance of Avoid critical defects, fix non-critical defects quickly goal. If you want to learn more about the way the scorecard values are calculated, check out the Scorecard 101 article. Here is an explanatory video that summarizes some important findings of the article. 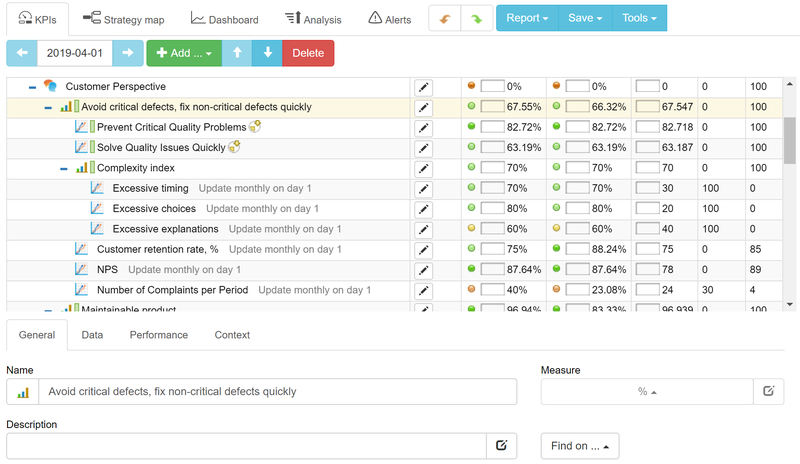 10 Tips About Using KPI Scorecard for Ongoing Quality Control. In the previous parts, we discussed how to build a Balanced Scorecard for quality and execute a quality strategy effectively. What about quality on the operational level? In this part, we will discuss ten ideas about using quality KPIs for ongoing quality control. Why do you need to measure the quality? What aspects of quality are important to your customers? How exactly is the company planning to achieve current business goals? What quality-related problems need more attention? What are the business challenges of your company right now? 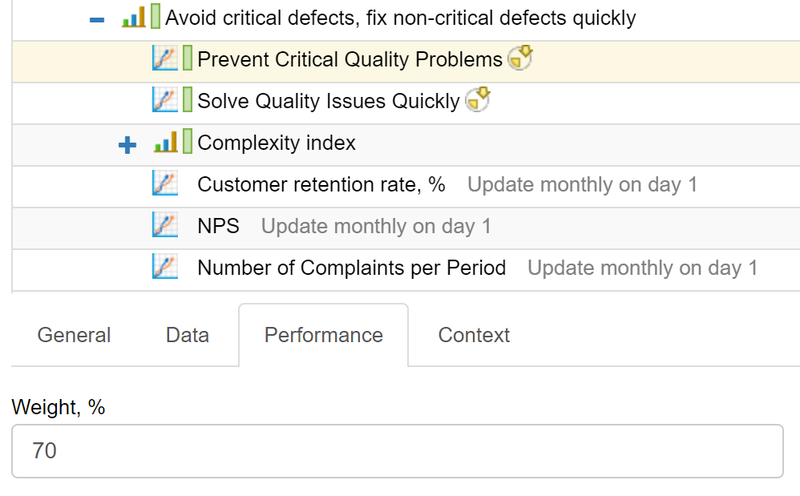 In BSC Designer: go to the “KPIs” tab. There, you can formalize your business goals and align KPIs with these goals. Quality control or speaking more generally, quality assurance, is not only about having a set of indicators and reporting them. The idea is to have an understanding of the processes in the organization, their strong and weak points and trying to prevent possible quality issues. The result of this analysis can be formalized in the form of a flow chart. 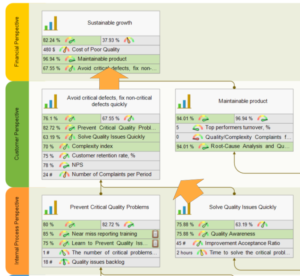 In BSC Designer: go to the “Strategy Map” tab, create a new map and use it to visualize your process. Later, you will be able to visualize some KPIs directly on this map. Have a look at the flow charts created in the previous step. On each step, there is some input used and some result produced according to the defined standards. You can have quality indicators associated with those control points. Those might be leading or lagging indicators. Lagging indicators tell you a story of what has happened. This information is useful, but you are just observing what happened, and you cannot change anything. In contrast, leading indicators reflect inputs that influence the process. On your quality scorecard, you need to have both – leading and lagging indicators. In BSC Designer: select the type of indicator on the “Context” tab, leading and lagging indicators are calculated in different ways. 4. What are the Most Important Indicators? Reducing the defects number from 0,01% to 0,001% might slow down the whole production system, and while your clients were happy with a 0,01% defect rate, for them, other product parameters are much more important. You need to find a balance and reflect the importance of each of the indicators on your scorecard. In BSC Designer: you have a weight property for an indicator on the “Performance” tab. Learn here what weight means and how it is calculated. 5. What is the Performance of an Indicator? Let’s say you have a 1% defect rate, then you optimized the process and achieved a 0.1% defect rate; finally, after an introduction of additional quality measures, you got a 0,01% defect rate on average. How was the performance of the respective quality indicator changing? Was it improved 10 times and then again improved 10 more times? Not necessarily! From a business viewpoint, clients might be unhappy with a 1% defect rate, and really happy when you have a 0.1% defect rate and achieving a 0.01% defect rate may not have made any visible difference to them. Some indicators have a linear performance function (you improve the value of an indicator 10 times, and the performance improves 10 times). Some indicators have non-linear performance, e.g., the performance of an indicator might grow slowly in the beginning and then the function converts into an almost flat line, meaning that further improvements don’t improve the end performance. When designing your indicators, choose an appropriate performance function for them. If we stay below the 6 days’ time frame, the performance is in the green zone. If we develop prevention plan for a longer time, then performance drops quickly to the red zone and then to 0%. In BSC Designer: there is an “Optimization” drop list on the “Context” tab for indicators. Change there the linear optimization function to a more relevant one or specify your own function. When you have 50+ indicators on your quality scorecard, each with its own performance function, benchmarks, values, and weights, then theoretically you can calculate the performance of each category and then the performance of the whole scorecard.As a result, you will have a single number (some call it a “quality score”). I know some top managers ask for a single quality score, but in most cases, it won’t make any sense as this number aggregates too much data. It looks nice in the reports, but it won’t give any meaningful information for a top manager.The better option is to group indicators into categories and report the performance of each category. For example, from the scorecard discussed above, I can see how the organization performs in terms of learning efforts or internal improvements. In BSC Designer: the program can calculate the performance figures for indicators, goals, perspectives and for the whole scorecard, but the end usage is up to you. Be sure that you have (preferably in writing) some plan aligned to each quality indicator. What will you do if this indicator gets into the red zone? Are there any routine procedures associated with this indicator? How long will it take to execute the action? How often do you need to revise this indicator? Who is responsible for an indicator? In BSC Designer: select an indicator or goal, click the “Initiatives” button, specify relevant details, budget, link to some documents, and choose a person responsible. 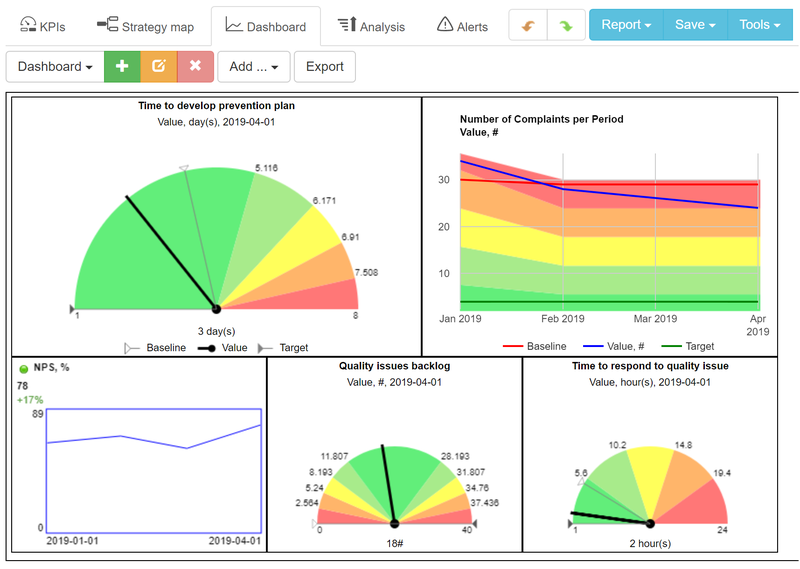 Dashboards help to visualize quality indicators. For some of them, you will need to use a gauge-style chart, for others the best option is to display a time chart with a trend line. A well-designed dashboard will give you a top-level view. Use it together with indicators visualized on the map. For more dashboard-related ideas, check out the Dashboards Insight website. In BSC Designer: you can create a number of dashboards to visualize your indicators. Even if you check your indicators regularly, you overlook a negative trend. For that purpose, track the indicators’ value for a longer period of time. For example, taking a 3-month period as a base for calculations, you might see that an indicator is trending into a red zone. This will serve as an excellent early-warning signal for your team. 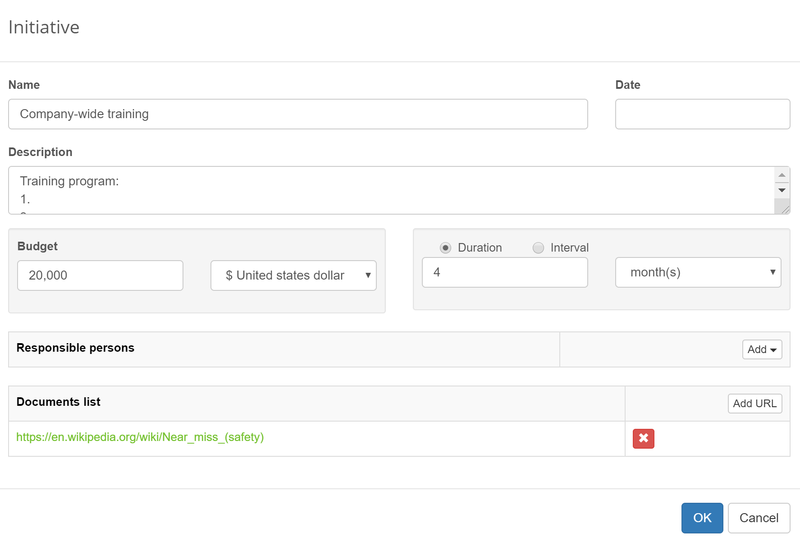 In BSC Designer: Use “Forecast Analysis” on “Analysis” tab to forecast indicators’ value. If some quality indicator has gotten into the red zone, make sure that all of the quality specialists involved get a notification about the problem immediately. Also, make sure that your quality scorecard is updated with fresh data, and you are looking at up-to-date quality information. In BSC Designer: setup notifications for the indicators on the “Alerts” tab. The software can send out a notification if an indicator has got into the red zone, or if an indicator was not updated on time with fresh data. There are many stakeholders of quality that perceive it in different ways – prospective clients, customers, partners, our team, regulators. Good news: we can still quantify, measure, and even predict quality. Feel free to share in the comments some interesting findings about measuring quality. Quality Scorecard discussed in this article as a starting template for your own scorecard!